The Crystaline Crushblat (コンペイトウモドキ?, lit. : "Pseudo Konpeitō") is an enemy found in Hey! Pikmin. It is a cave-dwelling relative to the Calcified Crushblat. The Crystalline Crushblat mostly sit in an idle position, only moving when it senses Pikmin nearby. It will then slowly walk over to them and attempt to crush them with its crystalline body. 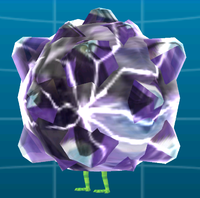 The Crystalline Crushblat can be defeated by breaking its outer shell, and then using any Pikmin type to damage its exposed body. A Crystalline Crushblat coming out of a hole. Spanish Cristálido patilargo Long-Legged "Crystallide"
This page was last edited on March 5, 2019, at 14:15.